This color is just one of 720 colors made from the 36 Real Color Wheel. These are the hexadecimal code numbers of each color for print artists and web artists. Day 7, Most of the color change happens in day one. 12. Lime Pigment, Lime white pigment goes on very translucent and not at all smoothly. It quickly becomes more opaque. 13. Zinc White, applies at about the same translucentcie as the lime white pigment lightens to while wet. 02-26-04 1/4 inch hard pressed masonite board sealed on top with cement adhesive/bonder, Metal lath attached with gorilla glue, one tack every 2-3 inches. Adhesive bonder in #60 sand lime base mortar. Top coat 1:1 lime and #16 sand only, no adhesive/bonder or alum, this is a very dry mix. I forgot to wet the support and only gave it one coat of binder, it might crack because of this oversight. I used lime water only in the pigments. 10:00 First thin coat of Green Earth, wait until the shine is gone, second coat and wait. I'm using a lot of pigment and it is very translucent. The longer you wait between coats the less pick up. 11:00 Start adding test colors. The smoothest stroke is made with the brush barely touching the surface in short strokes, so the mortar pulls the pigment from the brush, which it does. The short strokes gives the pigment time to work with gravity and fill the tip again. 12:45, Finished painting test colors, still absorbing well. I didn't photograph it until 6 hours later :(. Color changes have already happened. It just doesn't seem like zinc white has any power. Lime pigment is warm, titanium white is cool and WYSIWYG. Day 7, very little color change, these pigment are great in lime. 11. Genuine Vermilion is very dense and opaque. 15. Lime Milk plus Zinc White, applied easier then lime milk alone, looked the same while applying. 17. Zinc White, applies at about the same translucency as the lime white pigment but is a much cooler color. Test colors over Titanium White, Green Earth, Vermilion Genuine, Green Earth, Cadmium Red, and Burnt Sienna. I put glue on a base that was cracked and glue in the intonaco. intonaco = 1 small sand and .5 small crushed limestone, 1.5 lime = 1:1 The support was finished at 2:05 with a fairly dry dry mortar. It started cracking in 15 minutes. Maybe I applied it too dryly. 12:25 limewater medium only.. start adding base pigments.. titanium white covered quickly, vermilion genuine absorbed quickly, green earth is very transparent and soaks in slowly, wait, add another layer, wait, add another and another, cadmium red, burnt sienna is translucent and it takes a lot of pigment to become opaque, it soaks in quickly. 3:45 add first overlay colors, Horizontal, Light Gold Ocher, Yellow Ocher, Raw Ocher, Italian Warm Ocher, Burnt Sienna, Burnt Umber, Titanium White. I can't be sure yet but I think titanium white wasn't pulling right. 4:10 stop. 5:05 add second overlaid colors, Vertical, Light Gold Ocher, Yellow Ocher, Raw Ocher, Italian Warm Ocher, Burnt Sienna, Burnt Umber, Titanium White. 5:25 stop. The Naples Yellow stripe was put on last with casein and limewater. I think four and a half hours passed the absorbing limit, I'll know in two days. Here are the second day results. Woa..
All of the horizontal strokes over the base coat were locked in. All of the vertical strokes did not. They came off on a wet cotton swab. Including the Naples Yellow put on with casein and limewater. This test is really for the books! Three and a half hours is the maximum fresco painting time. I'm going to stay with three hours and keep the mortar fairly stiff. Day 3 showed no difference in colors. 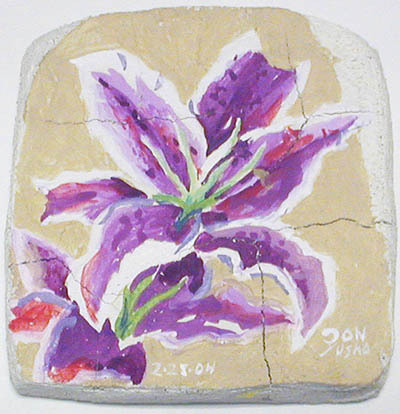 12:45 Start and finish a Small Lilly fresco, same mortar a little wetter and it is not cracking.. yet. 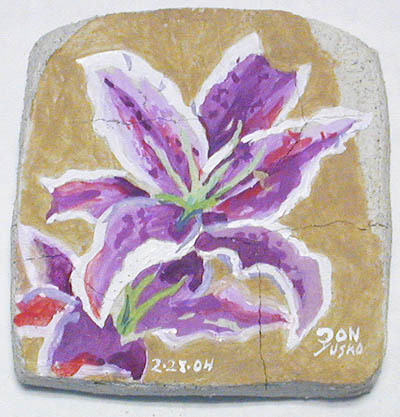 Finished Small Lilly 3:45, background is Italian White Earth, lilly is Quinacridone Magenta and Titanium White with some Thalo Red. The mortar started cracking even with the glue in it and the mortar is still soft enough to finger dent.. the glue did not effect the pull. My painting technique is finish every small area compleatly, for the lilly it was one petal at a time. Checking It on the second day shows it made it fine, all the colors were locked up. All painted with only lime water, no wash tints, only opaque tints made with titanium white so I could see the final color as I was painting it. By the way, Titanium white has to be washed out of the brush with soap and water just like all the modern colors. Here is day right after it was painted and day three. The cracks are bigger.. That's because I didn't scrub off the carbonate before adding the intonaco. Or.. maybe the glue I added to the mortar was a bad idea.